Earth Matters - Why Caribbean Islands Went Brown And How Long Will They Stay That Way? Why Caribbean Islands Went Brown And How Long Will They Stay That Way? NASA Earth Observatory images of Barbuda by Joshua Stevens, using Landsat data from the U.S. Geological Survey. 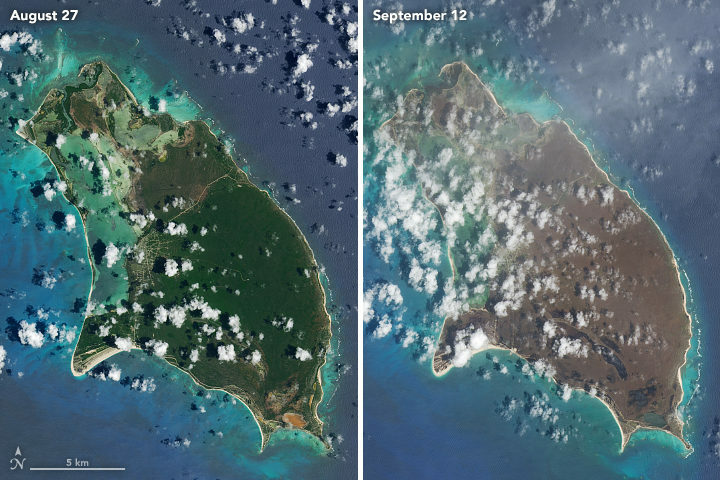 We recently posted several striking pairs of satellite images of Caribbean islands before and after they were hit by Hurricane Irma. The images show lush, green vegetation turning a dark shade of brown. We were curious about what exactly caused the damage and how quickly vegetation might recover, so we checked in with Edmund Tanner, a University of Cambridge ecologist who has authored multiple studies about vegetation damage and recovery after Caribbean hurricanes. EO: What were the primary mechanisms that turned the islands brown? Leaves blown away by the wind? Mud and debris covering them up? Salt spray killing them off? Away from the sea (100 meters or so), most of the green to brown is the loss of green leaves because they were blown off. Native vegetation on these islands has been through hundreds of hurricanes since the last major change of climate (10,000 years ago, the end of the most recent ice age) and have been naturally selected to lose leaves and small branches and re-sprout. I doubt if it is mud since the fairly heavy rain will have washed that off. Most of the water falling on the vegetation would have be fresh—rain—not sea spray. EO: How long will it take for the vegetation to recover? EO: What about storm surge? Was that a major factor in killing trees and other vegetation? Salt water from storm surge may have killed trees whose roots were inundated with it. Those trees will take much longer to recover because the soil will need to be desalinated naturally by rain, and seeds will have to germinate and grow. The areas involved are not likely to be large—a fringing zone of a few hundred hectares in some places. EO: How useful are satellites in assessing vegetation damage caused by hurricanes? Very useful. Especially for measuring the change in green from before the hurricane to brown immediately after the hurricane, to greening up over weeks and months after the hurricane. Modern analyses of satellite images could also show the decrease in individual tree canopy size if trees lost big branches and only regrew them slowly. 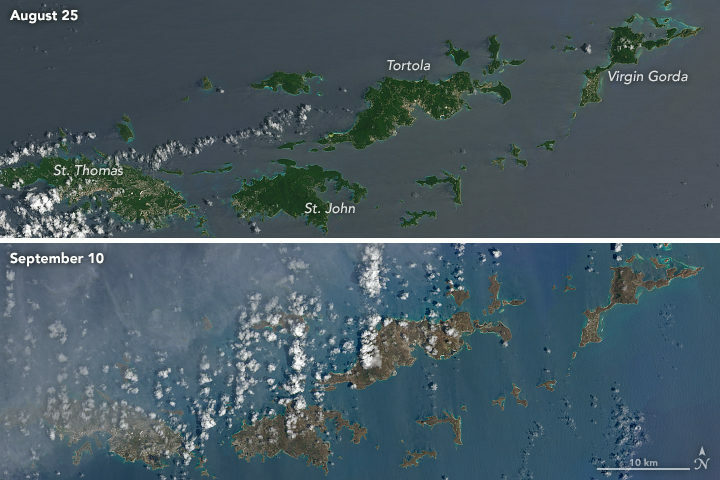 NASA Earth Observatory images of the virgin islands by Joshua Stevens, using Landsat data from the U.S. Geological Survey. This entry was posted on Monday, September 18th, 2017 at 11:44 am and is filed under Roundtable, Storms. You can follow any responses to this entry through the RSS 2.0 feed. Both comments and pings are currently closed. Hope that it will be possible to get researchers on the ground to learn more, especially with double impact from Maria. Research can double as recovery/development initiatives if reasonably well thought out. I find the colours very suspicious especially when silt is not involved?. Explain the use of the word “suspicious”, please. Is there an explanation for the difference in ocean color for the Virgin Islands images? One reporter I watched on TV as Maria crossed Puerto Rico said he could taste the salt water running down his face. I don’t know how close he was to the shoreline but he was nowhere near any beaches. Why is the sea grey in upper photo of BVI and blue in lower photo of BVI. It appears the colours have not been normalized as well as for Barbuda.. I have been communicating with BVI and the Islands are in lock down with only humanitarian assistance permitted but most simple housing has been destroyed but some resorts have mainly landscaping issues. The locals are asking for assistance for basic needs of water and food. The same Irma effect in Florida. The leaves of half the trees and shrubs and hedges turned brown. Not from storm surge, but from wind and salt spray. I would love to see the progress of green returning. I hope you will follow up in 3-4 months with new pictures. With so much destruction, it would feel good to see the regrowth of the vegetation. After Irma, the non-salt-tolerant plants and trees in my Florida yard turned brown. (Some actually looked as if they’d been burnt: leaves and stems were partially eaten away and black in color.) However, salt-tolerant plants such as sea grapes and sea grasses were fine. I’ve been watching my Irma-damaged plants closely and they’re already sprouting new green growth. New leaves, new shoots, everything. It’s exciting to see the plants rebound so quickly. So I am visiting Puerto Rico January 16-25…. Four months from now. I mostly want to spend time in El Yunque National Rain Forest. Do you think that the rain forest will be looking more “RAIN FOREST” like by then?? Or will I still be seeing a lot of brown, bare trees??? What do you think I should expect to see as far as vegetation in the rain forest? By January 2018 I expect the El Yunque National Forest in Puerto Rico will be mostly green. The palm tress that at every common on the steep mountain slopes will be growing new leaves now and many other tree and liana species will be growing fast. The full sun and rain results in rapid growth. There may be rainfall samples taken in previous storms that would have information on salinity at different elevations. The Luquillo Mountains range up to 1000 m and have very high rainfall much of the year.